As you guys may or may not know, I spent the summer and a good part of fall in Lahore. I attended pastry classes during the day, and religiously met friends and family in the evenings, but on Sundays, I brunched. I enjoyed brunch in Lahore more than I have in Chicago, and that’s mainly because of a magical place called Amú and it’s perfect menu. Without fail, every time I went, which was on occasion, two Sunday’s in a row, I had their Iced Latte. Now, it’s not that I’ve never tried an iced latte before. I mean, who hasn’t done a Starbucks run for an iced latte? But I was uncontrollably addicted to this iced latte. Maybe it was the ritual of pouring sweetened vanilla milk over translucent coffee hued ice cubes that sat on a bed of whipped cream, or the classic glass and the cute little glass pitcher you were presented with, all complete with an old school doily. It could also have been the serene surroundings, but the basic takeaway from this ode to the iced latte is that it was amazing, and I felt the need to recreate it when I got back home. You don’t need specialty syrups or a fancy espresso machine to recreate this iced latte. That’s another thing I love about it. It’s just good coffee, good old whole milk, and some good vanilla. This does need a little preparation on your part, just making the coffee and freezing it in ice cube trays, but other than that it’s simple and straightforward. I would suggest using good coffee, and using a french press to make it for the purpose of flavour, but even a keurig or drip coffee would the job. And for the ice cube trays, I would say stick to the classic sized ones. The larger ones will only work with room temp or slightly warm milk. Here’s what you need to make a delicious iced latte, with quantities varied completely to your personal taste, of course. There are so many variations you can do of this latte, but let’s stick to me telling you about how I made it. Nothing bothers me more than sugar in an iced drink that has not been dissolved. Think it through before you made the drink people! I usually have a bottle of simple syrup in my kitchen. It’s just equal parts of sugar and water. Put them in a saucepan on a medium-low flame stirring occasionally to help the sugar dissolve. Just for good measure I let it come to a boil before cooling and bottling it, but once the sugar is all dissolved you’re good to go. If you don’t want to go through the hassle you can mix the sugar into your milk, but mix it good. Butterfly the vanilla bean and scrape out all the goodness, and add it to your milk. Add the sugar syrup to the milk as well. I usually add one Tblspn to one cup milk, but you can add more or less according to your personal taste. 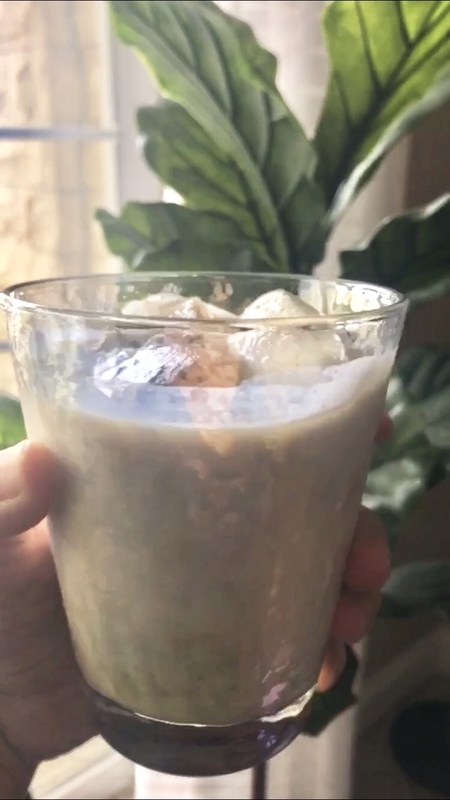 When serving, start with a dollop of whipped cream, the frozen coffee cubes, two-three to a cup, and then pour the sweetened vanilla milk over. It’s such a delicious sight, with the whipped cream floating up as you pour the milk and the coffee melting and marbling itself into the milk. Ugh so delicious! So that’s all! It’s very simple to make for a medium to large group of people as well, if you have the milk ready to go with the vanilla and a freezer full of coffee cubes.